When talking about 3D displays, we normally think of flat screens that somehow fake a 3D impression. Another way to present a virtual model would be to actually change the surface of your display to fit the virtual surface of the 3D model. The presented tilt display prototype. 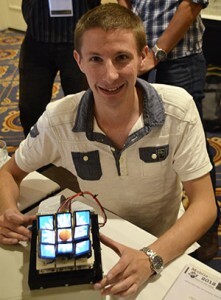 Jason Alexander and his colleagues are just experimenting with that idea and presented a first prototype of a tilt display at MobileHCI 2012 a couple of days ago in San Francisco. This kind of display consists of a number of small screens which can move up and down as well as tilt to any direction individually. In this way the screen can roughly represent the 3D surface of the displayed model. Especially for reliefs like maps this should work out quite well depending of how obvious the gaps between the tiles are. 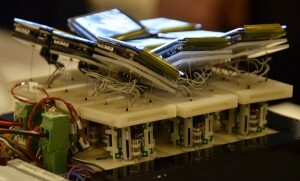 This prototype consists of 3 by 3 OLED screens with an individual resolution of 128 by 128 pixels. Each screen can move nearly a centimetre up at a maximum speed of 2 centimetres per second. The OLEDs are not touch screens and the device didn’t look like it would be a good idea to touch it at all. You can see it moving in the youtube video below. There have been other approaches of building deformable 3D surfaces usable as computer screens before, e.g. the shape display by Daniel Leithinger and Hiroshi Ishii which used motorised pins which can move up and down and a fabric on top to create a smooth surface. This display was ‘depth only’ and did not add a color component (a top down projection from a beamer would be easy to add). Alternatively the screen can be lit from below thru optic fibres or individual LEDs could get build into the moving rods (see Glowbits by Daniel Hirschmann). A totally different approach is the usage of magnetic fluids to model the surface, e.g. ‘Protrude, Flow‘ by Sachiko Kodama & Minako Takeno. Jason Alexander with his prototype. While being unclear whether these kind of devices will ever enter our homes or even smart phones, it’s interesting to play around with the idea and its implications. If the screen can move, would touch gestures still work or would the device be too fragile? Common gestures like zooming or panning might not work very well if the update rate of the display was too slow. Right now I can move around a map even if the individual tiles are not fully loaded, a 3D ‘pop up’ of tiles loaded dynamically on a shape display might be awkward. Maybe an alternative would be gestures above the screen without touching it. And what about the physical limitations of the screen? How steep can a cliff be and how useful is a 3D map if the depth has to be smoothed to work on the screen? You might think that a shift display with tiny pixel rods would be best as it would be able to represent any 3D surface / relief. But if a single pixel can stick out of the screen, wouldn’t it have to be very flexible to prevent breaking of a pixel… If it’s flexible however, this might make interacting with the screen via touch gestures more problematic. A strong material, that you can’t easily break of is also not the best option, as you might harm yourself in case the display forms into the shape of a razor (this would give the term ‘a sharp display’ a new meaning). The 3D part of the screen could also get hidden away under a glass plate. this way it can be more fragile or dangerous but still gives a good 3D impression for all viewers without glasses. Obviously the maximum hight of the display would be limited and the screen has to adjust the appearance when showing a relatively flat hill or the grand canyon. Here, techniques from HDR rendering could be used as the basic problem of mapping a higher range to a low range screen is the same. But will local HDR operators work here as well or just global transfer functions? For additional information see the paper ‘Tilt Displays: Designing Display Surfaces with Multi-axis Tilting and Actuation‘ (which also gives you pointers to other shape displays in the related work section) or the official youtube video.